South Africa 225 and 2-230 (Hashim Amla 99*, Graeme Smith 84, Mitchell Johnson 1-35) lead Australia 163 (Matthew Wade 68, John Hastings 32, Dale Steyn 4-40) by 292 runs. South Africa scored 225 runs in the first innings followed by 2-230 in the second after consuming just 38 overs. The Australian batting scrambled against the lethal bowling of South Africa and surrendered for 163 runs in the first innings. The entertaining second day’s play concluded on Saturday, December 1, 2012, at Western Australia Cricket Association Ground, Perth. Earlier, the Kangaroos started the day at 2-32 after 11 overs, David Warner and Nathan Lyon were at the crease with 12 and 7 runs respectively. The caught behind hosts lost Warner on the first ball of the 13th over when Warner was caught behind by the wicketkeeper AB de Villiers off Dale Steyn for 13. The night watchman Nathan Lyon was gone three balls later at his overnight score of seven runs. The miseries of Australia were multiplied when Ricky Ponting was declared leg before wicket off Vernon Philander for just four runs in his last Test of the career. The man in-form and the skipper of Australia, Michael Clarke, became the next victim of Dale Steyn for just five runs and they were reeling at 6-45 in 16.2 overs. 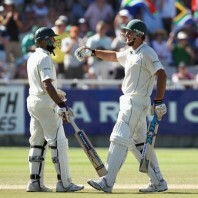 Michael Hussey and Matthew Wade tried to assemble the innings against the fiery spell of the Proteas bowlers. Wade was the most aggressive of the two and hit a couple of fours with one six in the 22nd and next over. The pair enhanced the score to 100 in 30 overs as Michael Hussey was caught behind by Graeme Smith off Morne Morkel for 12 runs. Wade scored his first Test fifty on the second ball of the 32nd over with a six as John Hastings carried on creeping from the other end. The score touched 140 mark when Wade was clean bowled by Robin Peterson for 68 off 102 balls with 3 huge sixes and 7 fours. John Hastings scored 32 runs as the entire Australian team was bowled out for 163 runs in 53.1 overs. Dale Steyn was the most deadly bowler with four wickets, Robin Peterson held three, Vernon Philander two and Morne Morkel got one wicket. South Africa lost their first wicket when Alviro Petersen was caught and bowled excellently by Mitchell Johnson for 23 off 20 with 4 fours at the total of 28 runs. 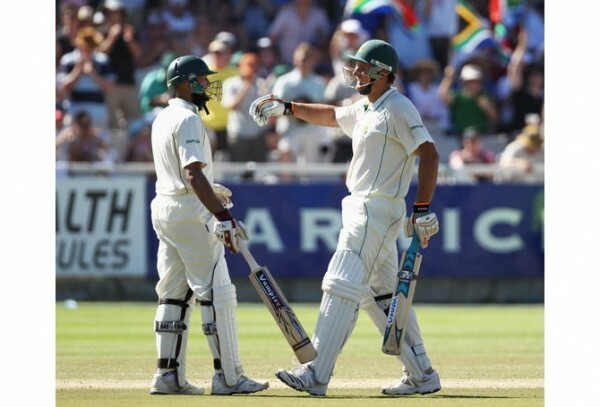 Hashim Amla joined in next with his captain Graeme Smith and they changed the tempo of the game instantly by sending the ball out of the fence at regular intervals. The pair rushed to 102 after 16 overs as Smith dispatched three back to back fours in the 21st over and attained his 35th Test half century. Amla achieved his 24th Test fifty in the next over and hit 2 fours in the 26th over as the duo continued with their attacking mode. The second wicket partnership contributed 178 runs partnership off 153 mere balls and enhanced the score to 206. Graeme Smith was caught by Nathan Lyon off Mitchell Starc for 84 off just 100 balls with 13 fours. 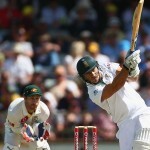 Jacques Kallis joined in next with Amla as the first was dropped by Nathan Lyon off Strac at three runs. Kallis dispatched 3 fours in the 37th over as the visitors hammered 230 runs for the loss of just two wickets in 38 overs. 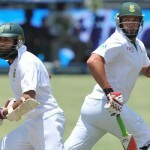 Hashim Amla was one run short of his 18th Test ton and Kallis was at the other end for 17 runs. The Proteas has gained a commanding lead of 292 runs with eight wickets still in hand and three days to spare. A lead of 450-500 runs will be a real hard target for Australia and South Africa looks like winning the third final Test.